Dominus is the ultimate fluid cable in Purist Audio Design’s Advanced Metallurgical Alloy Series. This uncompromising cable, developed through fifteen years of intensive research, offers a revelation in musical reproduction. Much the way a life-long driver of family sedans feels after slipping behind the wheel of a Ferrari, the audiophile enters a whole new realm of audio experience. The motion of the music becomes nearly overwhelming as listener and sound become one. Dominus interconnects are available in all configurations: RCA-RCA, XLR-XLR, even RCA-XLR. Purist Audio Design also offers a full line of speaker cables in configurations that include a true bi-wire and vertical bi-wire (incorporating double the conductors of a standard speaker cable) and a tri-wire (incorporating triple the conductors of a standard speaker cable). 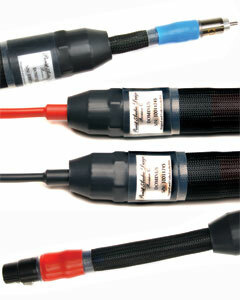 All are available in a complete variety of terminations that include 1/4” and 8mm spades, banana, pin, and Speakon.